With the Champions League and Pokal now a distant memory, the visitors needed to reestablish themselves as Bundesliga leaders and title favourites. However, Hertha vs Dortmund wouldn’t be a walk in the park for either side. “I love playing against Borussia Dortmund, I always score against them”, the words of Salamon Kalou prior to kick off at the Olympiastadion. The Ivorian striker was full of confidence going into this fixture and with good reason. A brace on Matchday 9 salvaged a point in the Westfalenstadion and Kalou’s goalscoring prowess raised its head again on just four minutes. Roman Bürki spilt a strong shot from Maximilian Mittelstädt and Hertha’s goal-getter was on hand to tap the chance home. 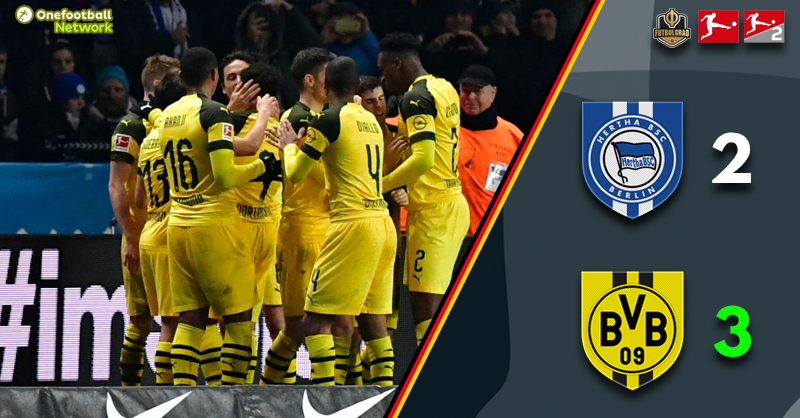 Dortmund looked rocked, Hertha’s aggressive press and high tempo had turned title chasers into startled rabbits under the floodlights. Experience Champions League football live! Book your European football travel now by visiting Nickes! The absence of Mario Götze and Paco Alcácer forced Lucien Favre to start Jacob Bruun Larsen as a striker – an unfamiliar position for the right winger. Dortmund had an odd look about them and Hertha knew it. However, it was a mistake by the Old Lady that enabled the scores to become level. Valentino Lazaro played a blind square ball, Thomas Delaney latched onto it immediately. The Danish midfielder drove at speed towards the Hertha end, as he approached the penalty area he looked to bend a shot past Rune Jarstein. It appeared to be a routine save for the ‘keeper but a wicked deflection off Karim Rekik’s heel looped the ball into the net. Dortmund were level, with a slice of good fortune. That slice of luck gave Die Schwarzgelben the impetuous to attack, and that they did. All of a sudden the balance of the game seemed to change from blue to yellow and black. As the clock ticked past the 20-minute mark it was the visitors who looked more likely to take the lead – Jadon Sancho began wreaking havoc down the Dortmund left. But, as seen so many times this season – Dortmund became the architects of their own downfall. From a position of dominance, they allowed Hertha to regain a foothold in the half. Julian Weigl was adjudged to have handled the ball in the area from close range – it was another intent versus distance argument. Did the midfielder have time to move his arm out of the way, did he move it the wrong way? The referee was in no doubt – penalty. Kalou stepped up and rifled the ball home from 11 meters to notch his fifth goal of the season, four had now come at the expense of Dortmund. A scrappy final period saw both sides display a number of misplaced passes. As the half ended it was the Berliners who had the lead and the look of winners – all smiles as they left the pitch. There must have been a frank exchange of views in the Dortmund dressing room during the break, as Favre’s side came out with the look of angry wasps. Dan-Axel Zagadou stung on 46 minutes, with the second half less than one minute old Dortmund were level. The defender lept to nod home from a quickly won corner. What followed should have seen the visitors take the lead, but they failed to take their chances. Christian Pulisic, Sancho and Bruun Larsen all had sight of goal but the Berlin net refused to bulge. Those packed into the Olympiastadion began to witness one of the best end-to-end flowing games seen in the Bundesliga all season. In typical Dortmund style, an inability to kill the game let their opponents back in. Marko Grujić rattled Bürki’s post before Ondrej Duda looked to be sent tumbling in the box by Abdou Diallo. This time there was no penalty and no VAR, the hosts were beyond livid. Television replays seemed to suggest there was a case for the video referee to become involved – the interjection never came. 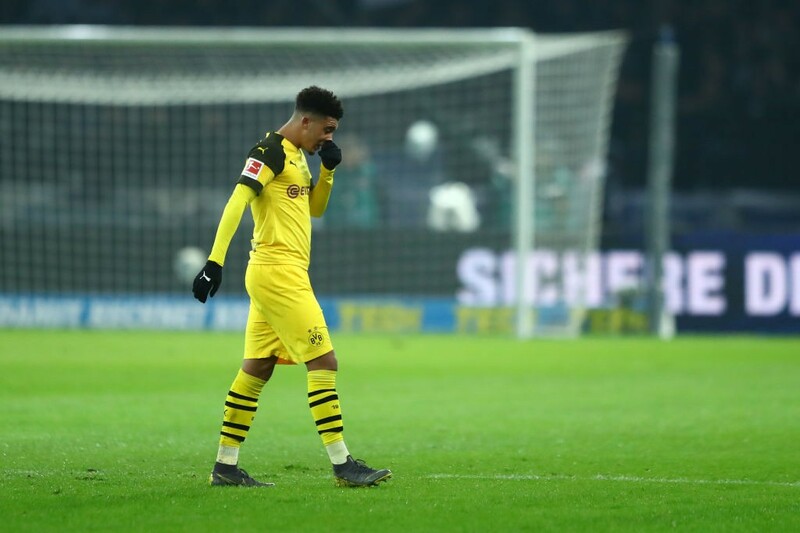 Dortmund knew that a draw wasn’t good enough and they went about trying to find a winner, Sancho and Pulisic swapped wings and the pressure intensified. Hertha’s net took on a charmed life, how their line wasn’t breached three times before the last 10 minutes will remain a mystery. For all the luck Hertha were having, Jarstein was producing moments of brilliance also. The third goal simply wouldn’t come for Dortmund. Until the second minute of injury time – Sancho picked out Marco Reus and the Dortmund captain broke Berlin’s hearts. Favre ran down the touchline – the result was massive as was the performance. 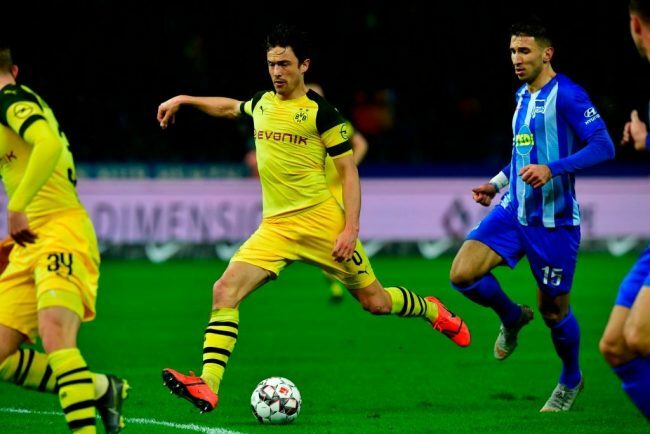 A late red card for Hertha substitute Vedad Ibisevic marred the final sixty seconds. An impetuous decision to throw the ball in Bürki’s face saw the striker righty dismissed. Not the best of birthday presents for Pál Dárdai, but he will want to focus on the positives – and there were plenty to take forward for the hosts. Notching his 11th and 12th assists of the season, Jadon Sancho became a Bundesliga record breaker. Overtaking teammate Mario Götze – who held the most assists for a teenager in a season, set eight years ago. The Englishman has had a terrific campaign, he has been omnipresent in Dortmund’s title charge and his display this afternoon puts the pressure back on Bayern. Dortmund eventually found a way of converting chances into goals. Eight shots on target – and 23 in total – should have yielded more goals with 10 minutes remaining. However, when needed, their biggest of players stepped up – captain Marco Reus captured all three points as he fired in a pass from Jadon Sancho. The pressure now falls to Bayern, who play Mainz on Sunday evening.